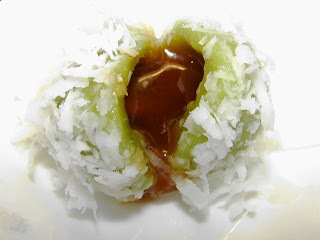 It has been years since I last had/made these soft chewy greenish balls bursting with a molten syrup filling. Ondeh ondeh is a Malay kuih (cake) the dough's texture is similar to Chinese/Japanese mochi cake, the filling is a dark palm sugar (gula melaka) once boiled turned to a syrup. The coating is freshly grated coconut, dessicated just will not do it's too dry. In Indonesia these same sweet balls have a different name called klepon. These luscious cute yummy sweet balls are one of those snacks once you start you can't stop eating. Only good eaten on the day made, at room temperature only. Once you put in the fridge the soft pastry will turn hard so is the sugary syrup. If you really want to keep in fridge for the next day or two if any leftover, you will need to steam them till just softened. If you microwave these babies they will burst very quickly. Here is the recipe how to make them. This recipe will make around 50 - 55 balls, size is about 1 inch wide. Note: * you can also use the normal orange flesh sweet potato but once you add the green pandan juice the dough colour will not look good. If you do use orange flesh sweet potato I suggest you omit the pandan juice just add water, the dough will not have the fragrance of pandan. about 350 - 400g gula melaka (Malaysian palm/coconut sugar) or gula jawa (Indonesian palm sugar). Both of these sugars are dark brown and usually in cylindrical blocks. Best use gula melaka more flavourful. If you cannot find gula melaka or gula jawa, can use standard palm sugar/jaggery may not have the caramelised flavour of gula melaka. Note: I have been thinking this morning if you don't like a sugary sweet syrup, maybe you can sub with a chilled and hardened chocolate ganache. Will not be authentic but tasty I am sure. Prepare and grate the coconut, keep in fridge till ready to use. Wash and cut the pandan leaf into small pieces then blend with 150ml water to a pulp. Then squeeze out as much water as you can then strain. Measure 150ml, set aside. Boil or steam the sweet potato with its skin on till cooked. Peel and mash while still hot to a very smooth puree. Mixed with the pandan juice and sugar to a wet puree. Add tapioca flour to the mix then add glutinous rice flour bit by bit till you get a non sticky stiff dough see slide show. Set aside. Grate the gula melaka/gula jawa, then sprinkle with a bit of water about 1 tbsp so the sugar is damp then squeeze and form into small pieces about 1 cm. Preformed sugar lumps is a lot easier to wrap then spooning loose sugar onto the dough. Divide the green dough into pieces. Roll the dough into a ball with palms, spread it out into a disc and wrap with piece of sugar. Once wrapped rolled between palms to form a smooth ball. Keep going till you have made all the balls. Boil a pan of water. Drop the balls into the boiling water. Gently stir and lift the balls several times during boiling. Keep watch for several minutes till the balls float onto the surface. Continue boiling for another minute. Take the balls out using a slotted spoon or small sieve. Shake off excess water. 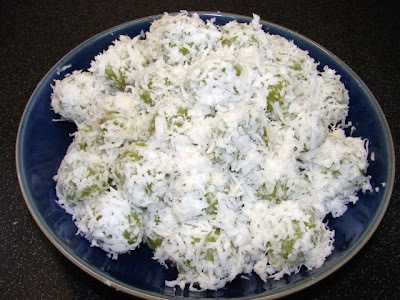 Drop the balls onto a pile of fresh grate coconut, coat and ready to eat right away. I made these yesterday, they are so yummy! It has been 15 years ago that I attempt to make them. Your recipe is much easier. Thank you. I used pandan paste instead of pandan leaves. I have already recommend friends to your web site. I live in the south coast in UK. Thank you Eunice for the feedback.